Traditionally associated with Christmas, red and green offer an array of options to embellish our homes for the holiday season. Actually, their use as Christmas colors dates back to paganism and early Christianity. Symbolizing respectively life, nature, revival, and eternity on the one hand, and on the other – birth and death, as well as Christ’s sacrifice, green and red are definitely universally accepted Christmas colors. As trends come and go, sometimes even retro orange, pink, and purple are used to add a fresh, unique look to Christmas décor. 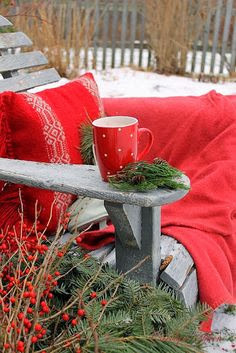 However, usually complemented by white and gold/yellow and sometimes blue, with some creativity and imagination, with red and green we all can go far beyond mundane seasonal décor and add some Christmas magic, charm, and personality to our living spaces. 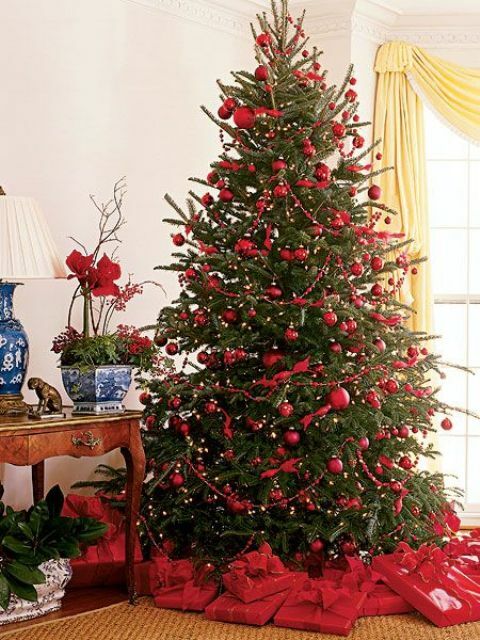 Whether outdoor or indoor, traditional or with a contemporary twist, Christmas décor in the red-and-green color combo is most definitely the easiest, the simplest, and the most affordable way to bring in the Christmas spirit. Unquestionably, nothing says Christmas more than a piece of traditional décor in red and green. A beautifully decorated Christmas tree complemented by attention-grabbing wreaths, candles, garlands, centerpieces, and more add festivity, warmth, and coziness and can help make this Christmas unforgettable. 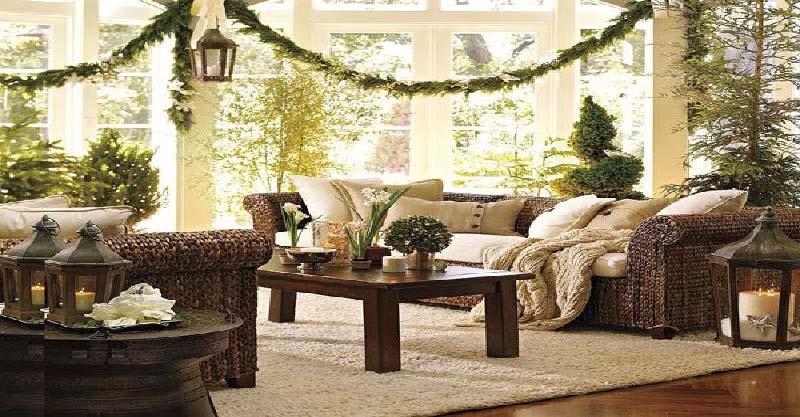 Are you ready to start planning your Christmas décor? When it comes to Christmas décor, the first thing anyone visualizes is an eye-grabbing Christmas tree decorated – as tradition goes– in red and green. So, if you are among those who keep the traditions alive and usually stick to the classic red-and-green color scheme, use your creativity to lend your Christmas tree a unique look. For some extra visual interest and texture, opt for ornaments, such as textile hearts, boots, stars, and figures of carol singers. Wrapping Christmas presents in shining green and red paper can also add glamor. A simple yet stunning option is to highlight the green tree with red ornaments, garlands, and ribbons and add some LED red and green lights. In the picture above, a traditionally decorated Christmas tree. Although only simple ornaments in red are used to decorate this tree, it immediately grabs the eye. Strategically positioned, it is complemented by the décor on top of a beautiful side table. Flower arrangements in beautiful pots and a table lamp with a stunning base add extra visual appeal, interest, and personality. Simplicity can be so beautiful! If your Christmas tree is positioned in the living room and you have a fireplace, then, decorate the mantel in the same colors. 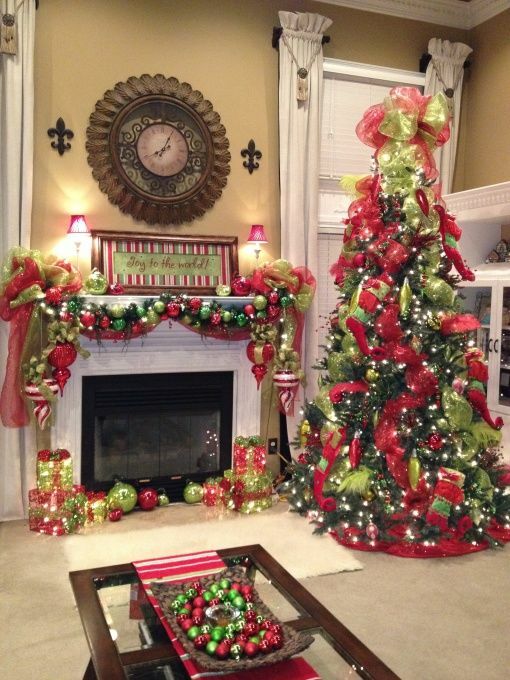 Shown above is a living room decorated in the classic Christmas color combo. A tree and a mantel beautifully decorated with red and green garlands, ornaments, and ribbons create an enchanting atmosphere. A simple centerpiece on top of the coffee table repeats the traditional red-and-green color theme. You can always add a Christmas tree to your outdoor seasonal décor. 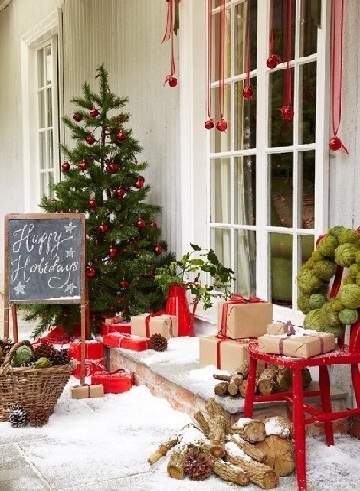 Above, a front porch with simple, easy-to-make, and budget-friendly yet fascinating Christmas décor predominantly in red and green. A Christmas tree, hanging red ornaments, beautifully wrapped boxes of different shape and size, a basket full of pinecones, a unique wreath made of foam balls of different size wrapped in green yarn, logs…What a fabulous way to welcome your guests in the holiday season! Commonly used as all-year round front door décor, wreaths definitely offer an array of Christmas décor options. From frugal DIY solutions with an organic vibe to lavishly decorated ones, wreaths of different styles and designs are a classic way to deck your living space for Christmas. Let your imagination run wild, even a wreath only in the traditional red and green colors can turn out to be a unique piece of seasonal décor and add extra touches of charm and festivity and dashes of Christmas magic to your home. Shown above, a wreath in red and green. 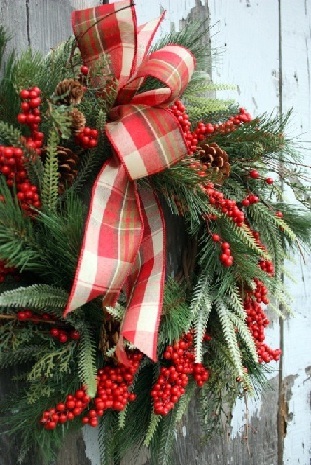 Made only of evergreens, berries, and pinecones, this wreath is simple and minimal yet so pretty and elegant. A beautifully tied ribbon adds some extra visual interest. Definitely a fabulous way to bring in Christmas flair! Think outside the box, wreaths can go far beyond front door décor. Whether alone or in groupings, hanging from railings and windows, turned into mirror/clock frames, mobiles, holiday table centerpieces, snowman door/yard sculptures, or used as plant stands décor, there is an array of unexpected ways to incorporate wreaths in your Christmas décor. In the picture above, a classic wreath in green and red complements the holiday table centerpiece. Beautiful, isn’t it? 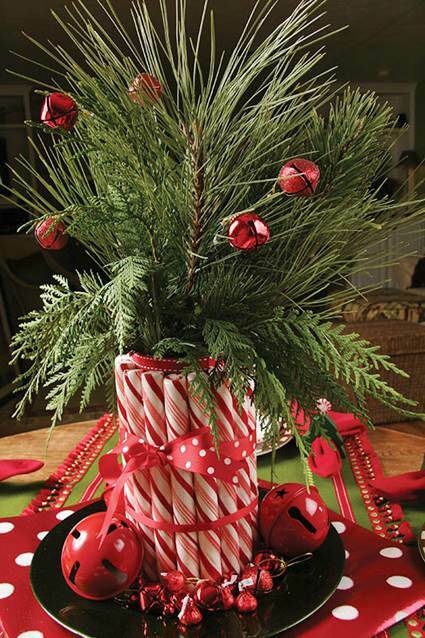 Unleash your creativity and try something different from the traditional evergreens, berries, and ribbons. What about using old scarves, foam balls wrapped in yarn, edible herbs, or felt balls to make your Christmas wreath this year? As for garlands, they can be used to adorn every corner of your home, from staircase railings to mantels, chair backs, windows, and front doors. Christmas tables should be both functional and beautiful, so, opt for a centerpiece that matches the table setting, complements, and beautifies it. You can use virtually everything to make a unique centerpiece, from flowers to pinecones and fir branches to ornaments and candles to mini wreaths and trees to candies, just unleash your creativity. The centerpiece is the focal point of the table, however, try to not overdo it and make it too overwhelming. Whether traditional or modern, minimal or lavish, the choice is yours, it is your home and your holiday table. 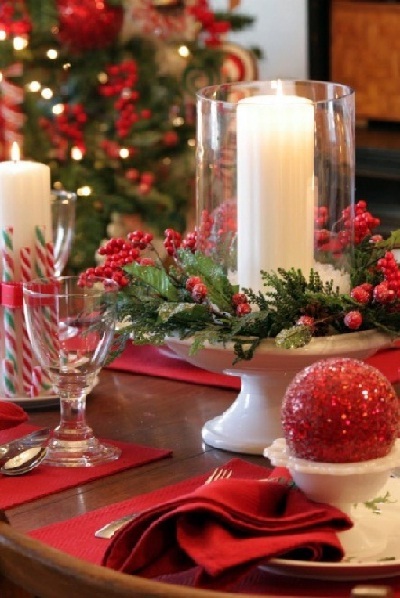 Above, a holiday table centerpiece in red and green. A grouping of three arrangements of different height adds visual interest, charm, and personality to the Christmas dining table. 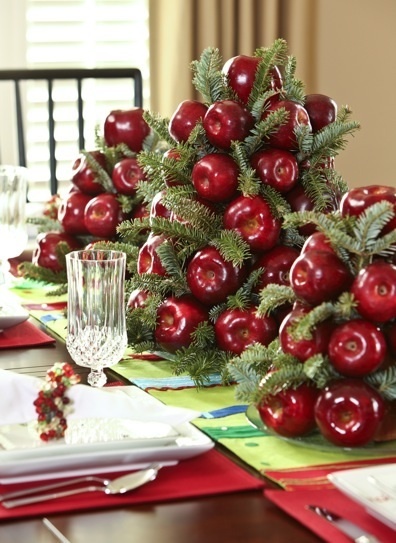 Made only of green fir branches and red apples, this centerpiece is so fresh, simple, and affordable yet elegant and truly impressive! Positioning centerpieces on top of the coffee table is a fascinating way to add some extra mood, charm, and personality in the holiday season. As with the dining table centerpieces, the options in terms of materials, designs, colors, and styles are endless, your only limit is your imagination. Above, a beautiful candy cane centerpiece. Arrange branches from different evergreens, candy canes, and some small ornaments, tie together with a ribbon, and voilà – you have a budget-friendly yet elegant, fascinating centerpiece. Position small yet charming décor accents to add dashes of this magic throughout your whole living space, indoor and outdoor. Choose from Christmas stockings, lanterns, candle and ornament arrangements, hanging snowflakes, Poinsettias, jingle bells, mini Christmas trees and Santa Clauses, and nativity scenes. When creatively scattered around your home, they can all do the job. Actually, even the most unassuming décor element, including budget-friendly DIY solutions, can help add some extra Christmas mood. Shown above is a simple yet chic green bottle arrangement. 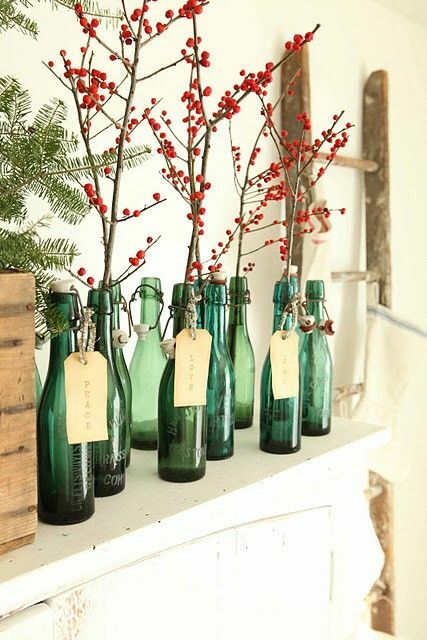 You need some empty wine bottles with a vintage look and berry branches to create this fascinating arrangement in the classic Christmas colors. Definitely a creative way to use wine bottles as Christmas décor! Consider that usually less is more! In the picture above, a garden spot decorated for Christmas. So charming…and romantic…Sometimes, simplicity is so beautiful! Undoubtedly, red and green remain the most traditional colors of Christmas. Whether only in these two colors or adding some touches of gold, silver, white, and blue, if you capture the magic of Christmas, your home will have a unique look for the holiday season.